Toronto : Individuals who retain a type of bacterium in their gut after a bout of food poisoning may be at an increased risk of developing Crohn’s disease later in life, a study has found. 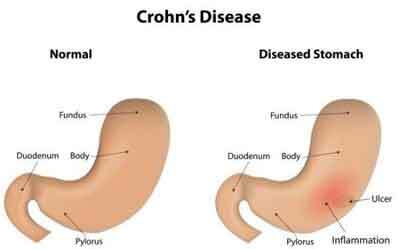 Crohn’s disease is a debilitating bowel disease characterised by the inflammation of the intestines. “This is a lifelong disease that often strikes people in their early years, leading to decades of suffering, an increased risk of colorectal cancer, and an increased risk of premature death,” said Brian Coombes, Professor at McMaster University in Ontario, Canada. Using a mouse model of Crohn’s disease, the researchers discovered that acute infectious gastroenteritis caused by common food poisoning bacteria accelerates the growth of adherent-invasive E. coli (AIEC) a bacterium that has been linked to the development of Crohn’s. Even after the mice had eliminated the food poisoning bacteria, researchers still observed increased levels of AIEC in the gut, which led to worsened symptoms over a long period of time. The finidngs indicated that new diagnostic tools needs to be developed to identify AIEC colonised individuals who may be at greater risk for Crohn’s disease following an episode of acute infectious gastroenteritis, the researchers noted. “We need to understand the root origins of this disease and to use this information to invigorate a new line of treatments and preventions,” Coombes said, in the study published in the journal PLOS Pathogens.